Last week we told you about Honda debuting the new 2016 Pilot at the Chicago Auto Show and the Canadian International Auto Show in Toronto, the Pilot’s sibling, the Ridgeline, also gave us a teaser of what the new design could look like. 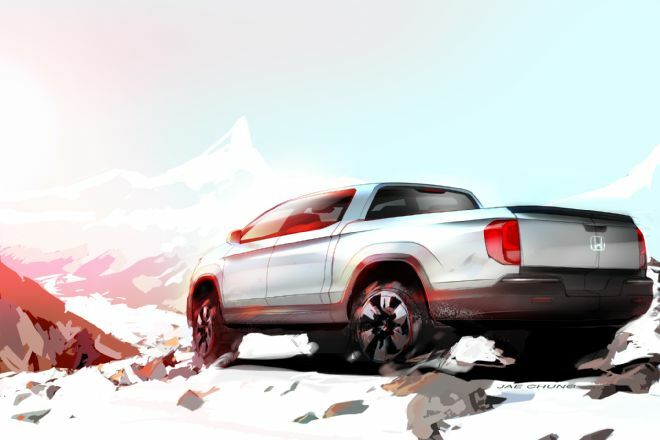 The sketch, by Jae Chung, is the first stages of what is to become the next Honda Ridgeline. The image suggests a longer rear, which will likely allow for more cargo space. The sloping buttress, very notable on previous models and presumably not well received, will be eliminated, replaced with a more conventional design featuring a flat, vertical rear window. The body also showcases more bodyside creases compared to previous generations. The tailgate features a vertical line down the centre, which could indicate two separate doors. It has been rumoured that a prototype was spotted in testing last month. The previous generation of the Honda Ridgeline was in production from 2006 – 2014.It is anticipated the new Ridgeline will use high-strength steel and aluminum components to decrease weight, a selling point on competing vehicles in this segment. In addition, the 3.5-litre V-6 engine found in the newly revealed 2016 Honda Pilot would be a natural fit for the Ridgeline, with likely 250 horsepower or more. The Ridgeline is expected to debut later this year so we will have to wait to see what new features Honda has in store! Stay tuned to the blog for more updates as soon as we get them!